This intensive, protective balm from A-Derma is excellent for keeping skin feeling comfortable during episodes of skin irritation. It restores the skin's softness, suppleness and defences with a lightweight and non-greasy touch. 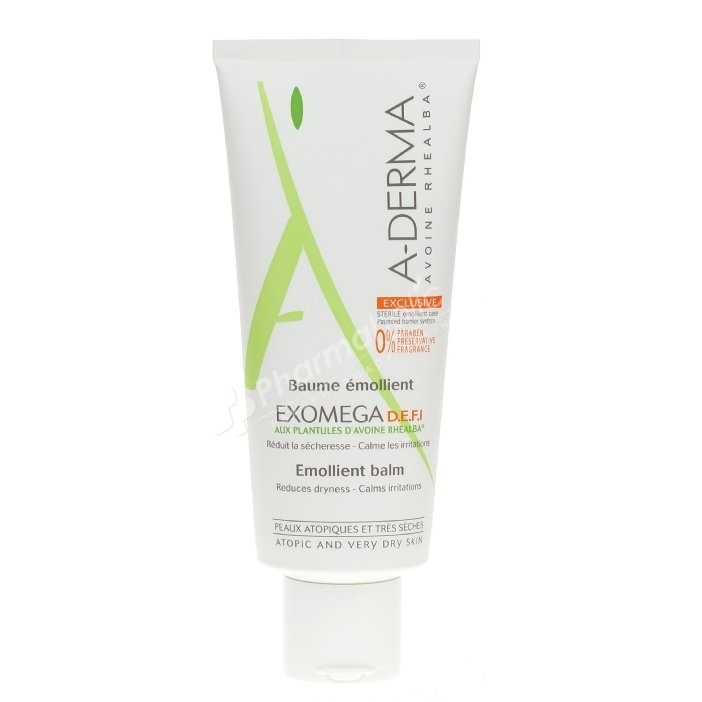 Aderma Exomega DEFI Emollient Balm is a sterile emollient care for atopic and very dry skins. It moisturises, protects and durably reduces redness, calms irritations and helps restore the cutaneous barrier. Its rich and non sticky texture is easy to apply and quickly absorbed by the skin. Paraben-free, its high cutaneous tolerance has been verified under dermatological and paediatric control. DEFI: Dispositif Exclusif Formule Intacte (Exclusive System with Intact Formula). This unique combination, resulting from Pierre Fabre research, guarantees a sterile and protected care all along the use. 0% paraben, 0% preservative, 0% fragrance. Hypoallergenic. Apply once to twice a day to dry zones of face and body.